The eye doctors at Northwest Indiana Eye & Laser Center strongly recommend that all patients have eye exams on a regular basis. We provide routine eye exams for eye health and vision correction for eyeglasses and contact lens fitting, cataract eye exams, eye exams for retina problems including diabetic retinopathy and age related macular degeneration (AMD), eye exams and screening for glaucoma and LASIK eye exams. We recommend patients have routine eye exams regularly to preserve and maintain good eye health and vision. 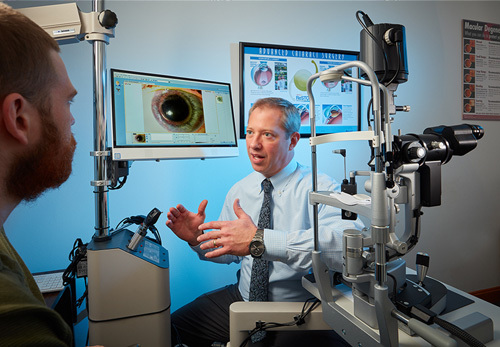 Your age, your general health, whether your family has a history of eye problems and whether you have been diagnosed with or treated for any eye conditions or diseases in the past, will determine how often our eye doctors suggest that you schedule your visits as well as what type of examination is necessary. What Will Happen At My Eye Examination? If you are scheduling a general eye exam we will include complete testing of your eye health and vision, including refraction, as well as a comprehensive medical evaluation of the health of your eyes. A complete history will be taken from you regarding your current general health, any previous eye problems or conditions that you have experienced and a review of any problems that you might be experiencing with your vision or your eyes. Please be sure to tell the technician or eye doctor about any medications you are taking for these medical conditions, including over the counter medications or eye drops that you may have been using. Your family history will be reviewed with you as well. Please tell us about any health problems that run in your family such as diabetes and high blood pressure, as well as any eye problems that your family members may have experienced such as glaucoma, cataracts or macular degeneration as they can tend to run in families. A technician will measure your vision, or Visual Acuity-both with your current eyeglasses or contact lenses, and without any vision correction by asking you to read a chart projected across the examination room that consists of numbers and letters that get progressively smaller and more difficult to read as you move down the chart. Next, the movement of your eyes, or Ocular Motility will be evaluated in order to understand how well the eye muscles function together and how effectively they move your eyes into the different positions of gaze. By shining a bright light in your eyes, your pupils will be evaluated to check your optic nerve function. Using a Slit Lamp Biomicroscope we will examine the health of your cornea, check for cataracts and examine your eyelids and lashes as well as the tear film to make sure your eyes are not too dry. 1-2 eye drops will be placed in your eyes so that the eye pressure, called Intraocular Pressure (IOP) can be measured to screen for glaucoma. Checking your Refraction is necessary to determine the eyeglass or contact lens prescription to correct your vision. Once your eye doctor has completed the examination of the front of the eye we will place additional eye drops to dilate your pupils and examine the health of the structures in the back of your eye including the retina and its blood vessels and the optic nerve. After the dilation drops are placed in your eyes, it will usually take anywhere from 15 to 30 minutes for the eye drops to fully work and dilate your pupil. Please be patient. The thorough examination of the health of the retina and optic nerve is not uncomfortable, but make you somewhat sensitive to light and may also blur your vision, especially at near, for a few hours after your eye examination. If you have not had a dilated exam in the past, it is a good idea to have a driver on your exam day. It is important to bring a good pair of sunglasses with you in order to lessen your light sensitivity.